Pittsburgh is home to one of the hottest culinary scene's in the country. Come see some of the best of the best at The Kitchen by Vangura. Born in Sicily, Executive Chef Giuseppe Di Gristina came to the United States at the age of 13 with his mother – who already had family ties in Pittsburgh, making him an honorary native of the “Burgh”. His original master plan was to study International Business with a Culinary Arts as a secondary field, but as destiny would demand, he soon found his way on the fast track to becoming one of this country’s most exciting and diverse chefs. In 2001, Giuseppe’s intense desire to continue his culinary expedition and training took him to the coast of sunny California where he held Executive Chef positions at Brio Tuscany Grill in Newport Beach and Crivello Ristorante in Wildomar. In 2006, Giuseppe became Chef/Owner of Raviolis! Italian Bistro winning “Best Restaurant” for 3 years and “Best Chef” in 2009-2010. Pledging to return to his “American” origins, Chef Giuseppe returned to Pittsburgh and found himself at home in the beautiful Tuscan environment of Bella Sera. Giuseppe brings passion and experience beyond his years to the elegant tables of Bella Sera through his culinary creations. Dorothy Tague has taught cooking lessons for 14 years. Chop, WOK & Talk is the only hands-on cooking school specializing in Southeast Asian cuisine, Southwestern cuisine and Mediterranean cuisine. Dorothy attended the Pennsylvania Institute of Culinary Arts and has a background in education. Dorothy Tague has studied Chinese, Thai, French, Italian, Mexican/Tex-Mex/Southern and Cajun-Creole cuisine throughout the years. Dorothy most recently completed studying Cajun-Creole in Langlois Nola, New Orleans. Experience the flavors of Thailand, France, Germany, Italy, southwestern United States, India and other countries with Dorothy. Dorothy and her co-workers at Chop, WOK & Talk give individual attention to all students according to his or her cooking skills. In the same lesson, a well-seasoned cooking student will feel challenged, and a novice cook will feel well-looked after. 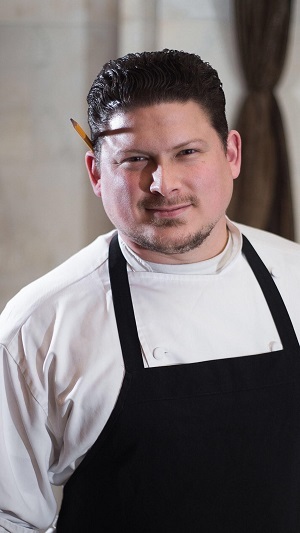 Chef David Bulman is a graduate of Le Cordon Bleu cooking school. David has worked at some of the top restaurants in the country including Bona Terra, Pittsburgh, and The French Laundry, Napa Valley and interned at equally as revered restaurants such as Alinea in Chicago, and Blue Hill at Stone Barns in New York. David currently owns and operates a brand new New-American restaurant called Seasons. Seasons is featuring a value driven tasting style menu sourced exclusively from local ingredients.Chef David and team forage many native ingredients, work with local farmers and, are farming many of their vegetables at the restaurants small 1.5 acre farm 7 minutes away in Alison Park, PA. This sourcing standard creates a unique cuisine that his highly sustainable, and artistically expresses the food in this moment in Southwestern Pennsylvania. Though I am from Chicago, the city of Pittsburgh has provided me with great opportunity to sharpen my talents and utilize my skills. It has blessed me with a beautiful wife & three amazing kids, along with a place to call home. I have worked both country clubs & private restaurants throughout my career, but feel that hotels give me the most thrill. It is the constant demand and philosophy that no two days are the same, which has excited me for over 10 years in hotels. A full house of banquet events and a steady flow of guests in the restaurant at the same time are my perfect combination for success in this business. I strongly believe in developing and mentoring the staff under me to promote growth to each individual. Along with being a Chef at various establishments, I have also taught 14 semesters in Food Hospitality at CCAC. I would like to say that it is a pleasure to support and live up to these goals that our culture has established. We take what we do seriously and utilize everything to its maximum potential. I am a chef that does not believe in waste, whether we can use it or donate it to a food bank, minimum product gets thrown away. We have a safe kitchen and a great operation. We are disciplined but have fun at work. Every day is a new day & would say that I am fortunate to do what I love.